We specialize in waterproofing solutions for both residential and commercial spaces. We have a team of experts who will examine and understand the nature of the leakage and cracks before starting the waterproof treatment. We follow appropriate methods to give the best waterproofing treatment for leakages in roof, basement, bathroom, terrace, Ceilings and Concrete Floors in Pune. What is the process of Waterproofing? Our technical team visits your place to check for the cracks and leakages in the affected area. After assessment, they give you a detailed report on the nature and extent of the problem. Provide you with an estimate of how much it would cost to resolve the issue. Once everything is approved, they start the work of waterproofing. We use a variety of products and brands for various waterproofing treatments. For external cracks and terrace floor coats we use dr fixit products. For grouting, we use epoxy grouts of Roff and for arresting dampness on walls we use Berger dampstop , Chemistik PDW or Dr fixit dampguard. Refer to the FAQ’s below if you have further questions on procedure, paints, customization etc. Let’s talk more about your requirements. Get in touch with us! Thanks We Will Get In Touch With You Soon! What are the kind of waterproofing works you undertake? We undertake coating system of waterproofing. This means that we essentially repair and apply various kinds of coats to solve your waterproofing job. Problems like walls seepage during the rainy season, rising dampness of walls from the inside and seepage on ceilings are done by us. My walls feel damp only from two to three feet from the floor. Rest of the walls are okay. Can you fix it? Sure. This is the most common type of seepage and its called rising dampness. Water from any source (usually water seeping through washroom or kitchen floor tiles) accumulatesds below the tiles slowly. Water being luid flows below the tiles and once it comes in contact with a brick wall, the brick wall being porous in nature absorbs the water and this shows up around two to three feet above your floor level. We fix this by cleaning your tile joints and applying an epoxy based tile grout. Additional checks of the drains are done and the area around the drain is sealed. If the seepage is very intense, then injection grouting is done. Injection grouting is a method of combating the rising dampness by injecting a chemical inside the floor which when it hardens, forms an impermeable layer and doesn't allow water to seep through the tiles. Will my tiles get spoilt by injection grouting? No. Your tiles won’t break. We only make a small incision in the tiles and inject the chemical and seal the incision with an epoxy grout. Which areas are usually prone to leakages inside a property? Usually the areas around washrooms, kitchen sinks, kitchen platform and balconies are prone to seepage and rising dampness. However, water finds its way below the floor tiles and it’s not always necessary that a leakage has to happen around the walls of a water source. Walls away from the washrooms, kitchens can also be affected by rising dampness. Can I use the washroom /kitchen immediately after the waterproofing treatment? We recommend that the area where the waterproofing treatment (grouting, injection grouting) is to be done, is kept dry for at least a period of 8 hours before the treatment and 12 hours after the treatment. So for nearly a day, the area where the work has to be done cannot be used. I have a crack in the wall and water is seeping through it in the rainy season? Can you fix it? Certainly we can. This seepage could be most likely due water being absorbed from the exterior side of the crack. In such cases, we inspect the crack, expand the crack, fill it with proper exterior grade crack filler and apply a crack filler paste of waterproofing coating around the crack. This seals the crack and the adjoining exterior surface and prevents water/moisture from seeping through and affecting your walls. I have water seeping through my ceiling? What could be the reason for it? There could be a leakage on the apartment, terrace or roof above your flat. If the leakage is on your bathroom ceiling, then most likely the source of the leakage is the washroom floor above your flat. If you have a terrace or roof above , then the leakage could be from there. I have a terrace above ceiling from where the seepage is occurring? What is the remedy? Usually I these cases, the terrace floor have to be inspected and regrouted or replaced if the seepage is heavy. 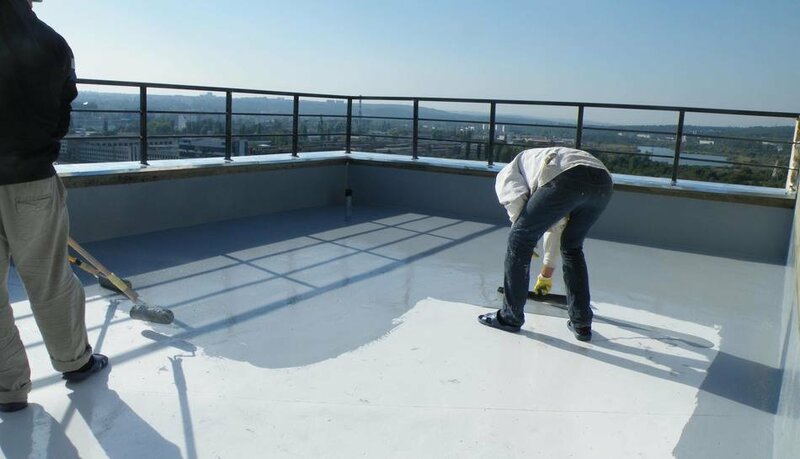 If the terrace floor is not damaged, but has cracks, then the cracks have to sealed and a water resistant coating has to be applied on the terrace floor. How is the terrace floor coat applied? Is it like paint? Terrace floor coats are coatings that are designed to be thicker than paint and form a protective layer that prevent water from seeping through. Since terrace floors are the most exposed part of a building in rains, most of the leaks occur through terraces. Terrace coatings are a three coat system where the top two coats are applied undiluted. Application is done by brush and roller. I have a leakage on my ceiling only at a particular place. Can we do a waterproofing floor coating on the terrace floor only around that area? Yes we can. However it is not recommended. Terraces are horizontal surfaces with the floor having a slight slope for water to run off. If the leakage today has occurred from one particular area of the terrace floor and we only do a treatment on that small localized area, the leakage will stop for some time, but water will continue to run off in all directions and in the future a leakage could occur from another area. Hence for terrace waterproofing, we recommend that the entire terrace is treated to prevent further inevitable leakages in the future. I don’t have a water seepage problem. There are the stains on my walls and ceilings? How do I get rid of them? Most stains are caused by moisture. The white chalky stains are efforescence, which is a deterioration of the cement as the water passes through the block. The black stains could be mold and mildew. Mold will grow on painted surfaces more so than it will on a bare block because most paints have organic properties which gives the mold something to feed on. Any of the stains indicate the presents of water. Getting rid of the stains in the short term is simple. Scrape the surface and get it repainted. However molds are the first signs of an impending seepage and should be rectified with grouting or crack filling. What causes the musty smell in my washroom? Obviously, the musty smell you have is much more than just a bad smell. Most musty odors in washrooms or small confined space are caused by moisture. It could be mold growing on some organic surface. Solving a moisture problem will usually solve the odor problem. Our waterproofing experts will inspect the effects of the mold situation, mildew, and musty smells in your home and come up with a mold removal solution. I got my washroom tiles regrouted, but the dampness on the walls hasn’t dried yet. What could be the reason? The grouting would have to inspected and checked for the quality of grout and its effectiveness. Usually it takes around three weeks for the seepage to completely dry off after the waterproofing treatment. If the dampness persists or increases, then the waterproofing treatment has to be reviewed. Inetrnal pipe leakages could also contribute to continuous dampness. I got my washroom grouted and it’s been more than a month but the dampness remains. Is my washroom pipe leaking? Usually yes. If there is a small leak in a concealed pipe, it will cause the walls to be damp, even after the washroom floor/kitchen floor is sealed by grouts. In such cases, the pipe would have to be replaced. Can paint be applied on the wall affected by seepage directly? If the seepage is very less, then yes. In most cases we recommend scrapping the damaged wall paint, applying three coats of water resistant chemical (Berger Dampstop, chemistik, dr fixit Dampguard) and then to apply waterproof putty and paint. What are the kind of products/brands you use for waterproofing? How much does it cost for a waterproofing job? Costs in a waterproofing job vary depending on the severity of the leakage, the area and the nature of waterproofing. External crack filling and grouting of washrooms usually cost less. Terrace floor coats and other treatments costs more. Freshcoats is a fully integrated painting services company located in Pune that provides comprehensive, high quality, reliable painting solutions to Residential, Commercial, Corporate and Industrial clients in Pune. © 2019 Powered By LiveFire Tech Solutions Pvt. Ltd.